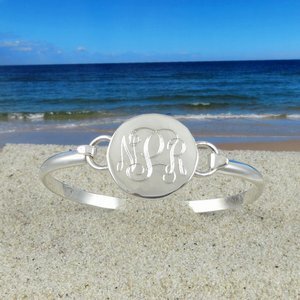 This personalized Monogrammed bracelet is made of sterling silver. It is handcrafted and beautifully engraved. Each bracelet is individually hand crafted to size for buyer. To determine your size, measure the wrist with a piece of string and then add a 1/2". For example: If the string is 6" long then your size will be 6 1/2.